While many companies are now trying to incorporate good ingredients into their products, there is one company that has been doing just that for 20 years. L’Occitane has infused shea butter into many of their products ranging from their shampoos to body creams. What I am most impressed by is the high percentage of shea butter found in their products. 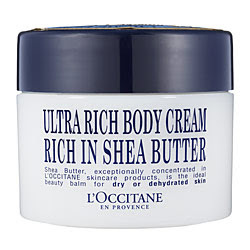 The feature of the day is the Ultra Rich Body Cream by L’Occitane which consists of a whopping 25% shea butter! L’Occitane didn’t stop there, this rich cream also includes rosemary, fruit extracts, wheat germ oil, almond oil honey and other skin nurturing ingredients. The single paraben that made an appearance on the ingredients list is the only item that caused me to raise an eyebrow. This is the type of lotion that makes your skin glow without making you look greasy. It leaves my skin feeling soft and moisturized. It is a very creamy formula but it is not loose, it has some real hold to it. Having “hold” means that you can turn the jar upside down and the product will not ooze out of the jar and onto your floor. You can purchase this product for $39.00 for a 7oz jar. Have you purchased anything from L’Occitane? L'Occitane is on my list. A lot of bloggers have mentioned it lately. I always thought about trying it, but just hadn't gotten around to it. Hi Lee thanks for reading. I posted a few reviews on this company in the past, they produce some nice products. I am way too cheap to buy anything from there, but I did get a nice sample once, lol. i love their deodorant. i have tried their hand cream in the metal tube also. do you think its worth it to get this as opposed to real shea butter which is cheaper? you know if you say yes, i am going to be up in the store tomorrow. my skin is so dry right now!